‌Dr. Davila was the original director of STAR-PREP. When STAR-PREP recruited the first cohort in 2016, Dr. Davila was an Associate Professor at University of Maryland School of Medicine in the department of Microbiology and Immunology. 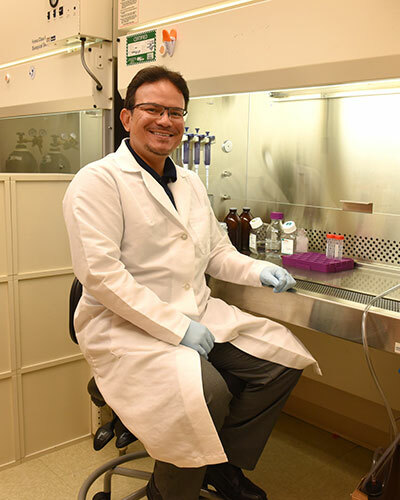 He received a PhD in Biomedical Sciences with a focus on Tumor Immunology from the Mayo Clinic where he remained and completed two postdoctoral research fellowships. Dr. Davila understood the tremendous impact that mentoring in research programs can have on the outcome of a scholar’s life trajectory and scientific career. He had the unique experience of being involved in research-oriented mentoring programs as a mentee from the time he was an undergraduate student where he participated in the Minority Biomedical Research Support Program (MBRS) and Maximizing Access to Research Careers (MARC), and as a post baccalaureate participated in the Patient-Oriented Research Program (similar to the PREP) at the Mayo Clinic. In addition to directing the STAR-PREP, Dr. Davila had an active research program at University of Maryland School of Medicine focused on developing cancer immunotherapies funded by several federal grants from the National Cancer Institute, US Veterans Administration and nationally recognized Foundations. Dr. Davila was the program co-leader of the Tumor Immunology and Immunotherapy Program at the Greenebaum Comprehensive Cancer Center at UMB. He largely attributed his success to these mentoring programs. Dr. Davila believes that diversity in the sciences is paramount. Diversification creates an environment of enhanced problem solving because people from diverse backgrounds often bring new perspectives to complex problems. Dr. Davila is currently Professor, Medical Oncology, Amy Davis Chair of Basic Immunology Research Director, Immunotherapy for the Human Immunology and Immunotherapy Initiative and Co-Leader of the Tissue-Host Interaction, University of Colorado Denver Comprehensive Cancer Center (UCCCC).